properly prepare the boat before shipping. The easiest way to make sure you haven’t missed something is to do your research and then make a checklist. This is the most important step to ensure the boat is what was advertised, and is also required for your insurance should you need to make a claim. We recommend you use this opportunity to get details for shipping as well, so you can have an accurate landed price, as often the sellers information often are incorrect and can affect your shipping costs. Boats with trailers cannot be imported to Australia without first obtaining a Trailer Import Permit which has a processing time up to 21 days. DAZMAC can arrange the import permit on your behalf if the trailer has a GVWR (ATM) less than 4500 kgs. Without permit approval, your boat & trailer will stay at port and will incur storage charges, if you can’t prove the GVWR of the trailer, it will be destroyed. You should get a photo of the compliance plate/sticker on the purchase report/survey as once it’s loaded on a ship you won’t be able to get one! If your boat has no trailer, it will need to be fitted with a steel or ISPM15 compliant timber cradle depending on the design of your hull. Cradle compliance will prevent you from incurring fumigation fees upon the boat’s arrival into Australia. Before making your final payment you should get the complete shipping price from DAZMAC with the confirmed dimensions from the surveyor and also get them to verify the documentation for the trailer permit application. Whether you purchased your boat from someone else or already own it, you must have a receipt, invoice or bill of sale to provide to customs for the import customs clearance. Customs do also request proof of the price paid by bank transfer so you need to ensure the value on the documentation is correct. An alternative solution if you have owned the boat for a while and its value has dropped is to have an evaluation of the boat done which will reduce the Import taxes applicable in Australia. Presentation of a photo ID such as a driver’s licence or passport photo page is required to gain export clearance from the USA and also for your import permit application. Its very important to clean the boat inside and out. Power wash dirt on the trailer and remove algae, barnacles or any other organic material from the hull. Wash and vacuum dirt or leaves from the hatch, engine bay and anywhere else on the inside of the boat. Quarantine are looking for leaves, seeds, insects, and plant materials and if they find any it will be sent for cleaning upon arrival at the importers cost. Before the boat is imported, its batteries should be disconnected and the cables tied off to prevent accidental contact. Make sure that water and fuel tanks (no more than 25% full) are drained as much as possible. Reduce the overall volume of your boat by removing swim platforms, keels, radar arches, bowspirits and flybridges to reduce shipping prices. Hatches should be tied down and sealed with tape to prevent them from opening up or being damaged from tempestuous water while in transit. Another important tip is to drain pumps, water systems and waste tanks. Upon arrival to the destination port, make sure to have the boat’s keys ready to unlock hatches for customs and quarantine inspection. You will be required to pay 5% Duty on the cost of the Boat and any transport fees accrued in the United States upon import unless you have a valid US Free Trade Agreement signed and the boat was manufactured in the USA. You will be required to pay Import GST of 10% on all costs related to the boat’s purchase, duty, sea freight, origin transport crane, cradle and terminal handling. You might qualify for the exemption of the 5% duty if your boat was manufactured in the United States. Provide a Certificate of Origin prior to your shipment if the boat and trailer was manufactured in the United States. Contact DAZMAC and ask about our qualified customs brokers for the destination charges prior to the arrival of your shipment to avoid surprises. Also, their advice will confirm all specific laws related to importing a boat to Australia. 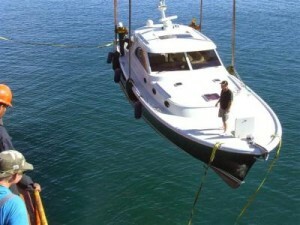 There has never been a more financially opportune time to import a boat to Australia. True, this involves thorough boat preparation and provision of several documents. However, learning the details of what you need to do to make your boat pass Australian inspection is essential to avoid unnecessary delays and charges. There are different shipping options available with varying transit times, the fast services start at 21 days transit and the slow services between 55-75 days not all ports in the USA have both services. We can certainly assist, can you please confirm the below information so we can arrange a quote? is it on a trailer or cradle? Please email it to sales@dazmac.com we should be able to quote within a day or two.